The Amish aren’t a chatty bunch. At least not with outsiders. Let’s just say ‘sharing personal info’ isn’t high on their list of priorities. So when single mother Rachel (Kelly McGillis) takes her young son Samuel for his first trip into the big city, where young Samuel inadvertently is witness to a murder in the subway restrooms, their initial reaction is ‘let’s all just forget about it shall we?’. With Book critically injured and Rachel and Samuel also in the sights of the bad guys as potential witnesses, all three seek sanctuary in Rachel’s Amish community, where Book is now the outsider. Despite the film’s title Witness is no low-tech Mercury Rising. In fact the kid is a mere bit part in this film. With the change of scenery comes a distinct downshift in pace, as first John must recover from his wounds before he can cautiously and slowly attempt to integrate himself into his new yarded environment, where intruders are treated like snarky mother in laws. But it’s not all wondering what’s on TV and whittling wood in Amish country. Book decides that he likes the way Rachel rocks her little bonnet, and she sees potential for Book’s stubble to develop as a long unkempt scraggly beard. Despite some furrowed brows and sideways looks, Book gradually finds favour by keeping his head low and by sweating with the oldies, building barns and such (which if you believe films that feature the Amish it’s all they’d do all day). And as these films tend to prove, if you don’t go out looking for trouble, trouble will eventually come looking for you. Final Rating – 7 / 10. 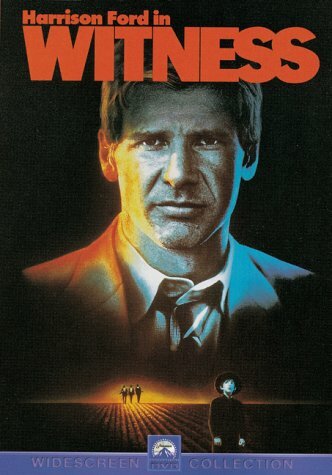 Many 80s flicks haven’t held up well to modern day scrutiny, and while Witness is indeed a bit slow for a long while, it is well realised and well worth remaining patient for.